Back on the Wii one of my favorite pickups was No More Heroes. Putting you in control of Travis Touchdown, an up and coming beam katana assassin climbing the ranks of killers, it was a strange game where you spent time dumpster diving and mowing lawns to raise up some cash one minute, and tiger suplexing fellow murderers the next. Enough of a cult hit to get a sequel back on the Wii, the series made a surprise return at 2017’s Switch unveiling with a new indie identity. Gone are the odd jobs and drive to be the best, and instead it seeks to revel in being a video game. Travis Strikes Again sees our former number one ranked assassin effectively retired, living on the fringes of society out of a trailer and playing video games all day. During an attack by Badman, father of one of the first No More Heroes’ bosses, the two are pulled into a phantom game console: the Death Drive Mk. II. Here they’ll take on multiple “games” for the system, carving through hordes of enemies and encountering themed bosses at the end of each to try and capture the high points of the series’ past. TSA doesn’t lean hard on its narrative, taking more of a concept from the setup than any sort of rich story. At times, the game feels like creator Suda51’s own observations and feelings on games (both retro and modern) before flipping its switch and pouring reference after reference. It runs the risk of overdoing it at times, that feeling exacerbated by the sense the game itself and the story that unfolds are driving in separate lanes. That said, the writing is fun and occasionally poignant (even with tongue button mashing cheek at every turn), with Travis’ over-the-top otaku-assassin personality returning in full force. Other times, it leans too hard into its brand of humor, making for a subjective experience on that front. 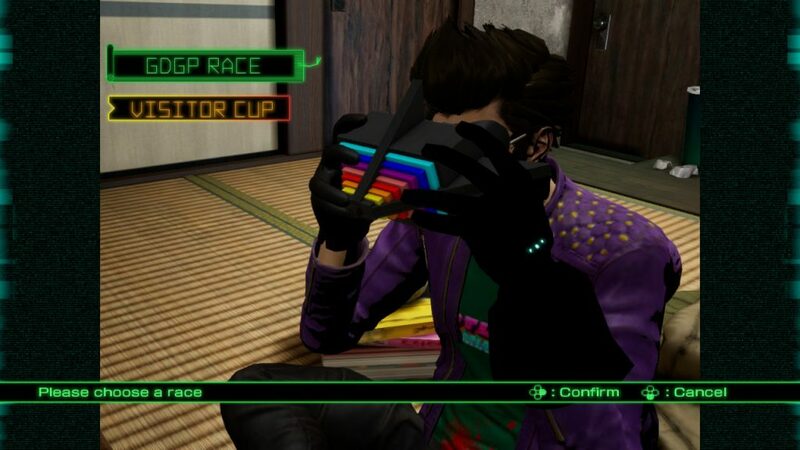 What really sells the game is how Suda51’s vision and touches pour out from every seam. As a creator, his thumbprint is unmistakable; and if you’ve ever been a fan of his previous works, you’ll be right at home (and pleasantly surprised before the credits roll). 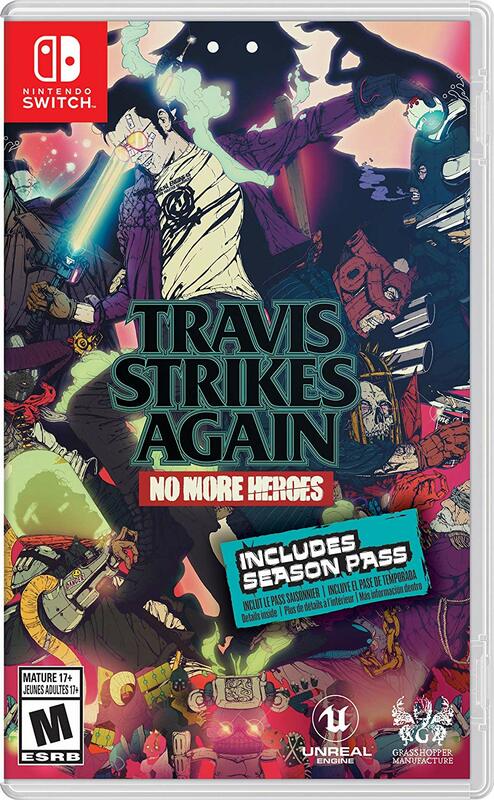 The game also exists as a side offering from the previous No More Heroes games, touching on previous points occasionally, such as Badman’s already mentioned motivation, but not demanding you be familiar with the ins and outs of Travis’ past exploits. 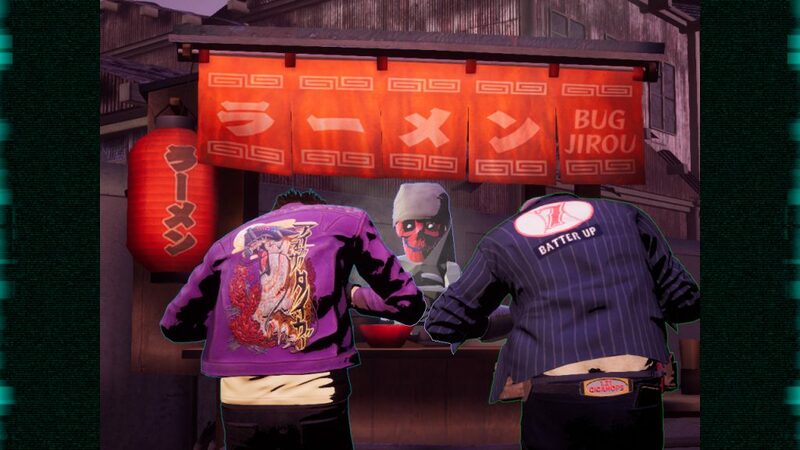 The bulk of your time playing Travis Strikes Again will be spent hacking and slashing through mobs of enemies in the Death Drive’s library of games. 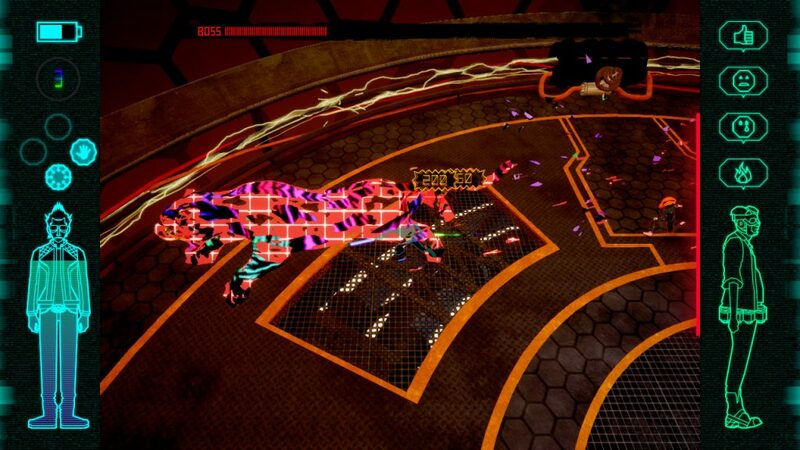 Armed with a weak and strong attack, it borrows from beat ‘em ups by fixating on the fact that crowd control is key. You’re able to use these both grounded and in the air, with all of these variations having their uses. Manage to carve through without getting hit and you’ll charge up special attacks, dealing big damage by forcing wireframes and neon tigers onto these mobs. Paired with these are unlockable skills, special equippable abilities that let you customize and tailor your attack options. A few early ones let you fire off stunning projectiles or areas that slow enemies down, helpful with keeping hordes in check or wailing on single targets. 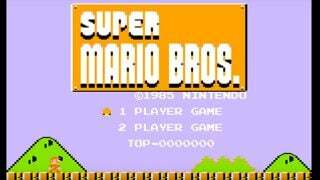 On top of that, you can play the game in co-op, letting player two control Badman with the pass of a Joy-Con. It works well, making this a game best shared on the couch with a few drinks for good measure. 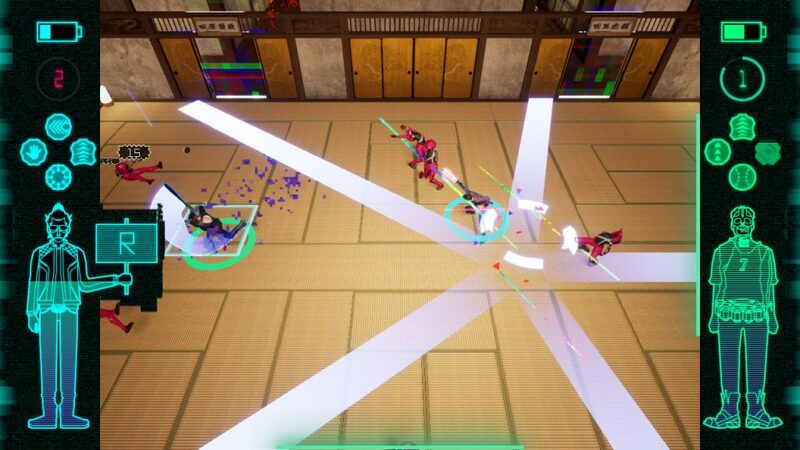 Gathering up plenty more skills over time, sharing them between players, and testing them out in different lineups helped with one of the game’s most unfortunate shortcomings: repetition. Even when each stage comes up with its own backstory, theme, and unique elements, you’re spending the vast majority of your playtime running from spot to spot, cutting down everything in your way until you encounter a midboss. Do it all again ’til you reach an actual boss, then get ready to jump into the next Death Drive game for even more. Areas can feel sparse and bare, contrasting the stylized character designs, and what attempts there are to make stages distinct fall flat more often than not. Light puzzle elements here, fixed camera angles there; it works with the TSA’s attempt to make each stage a completely different game within the game — but in the end, they’re often not all that fun. You’d think the bosses, a hallmark of No More Heroes, would help remedy this, but ultimately their series-appropriate designs are the best things about ‘em. The fights themselves have multiple phases and changeups as you cut away at health bars, but they never bring that climactic one-on-one dual feel; nor do they live up to their pedigree, which might be the biggest letdown in the entire game. If you’d rather not rush headlong into things, you can kick back at Travis’ trailer between Death Drive dives. You’ll be able to purchase and change into t-shirts themed to a bunch of real life indie titles, letting you represent the likes of Hollow Knight, Undertale, and many more as you see fit. You can also read up on old marketing materials for the fictional games you’re playing through, along with a block dedicated to different bowls of ramen you can savor at rest stops within the stages. I was surprised with how much I enjoyed coming back to the trailer, reminding me of the forced in between sections where you’d work odd jobs and buy new clothes back in the first No More Heroes. You’ll also get to play through visual novel sections decked out in extra retro green and black visuals, telling the story of how Travis and his somehow-talking anime cat Jeanne manage to gather up the games he’s playing through. These vary in length and the writing in quality, but conceptually they’re an interesting choice of a palette cleanser than somehow fits right in. In spite of all these shortcomings and complaints, I found myself still playing through Travis Strikes Again. How earnestly it holds to its identity and the occasional strokes of brilliance in its fourth wall awareness are hypnotizing in their own right. The supplementary information and intro cutscenes for its fabricated games are fleshed out and make me wish they had the budget and resources of past entries behind them. This may not be No More Heroes 3, and it may not be a game you’ll enjoy, but it’s a game that wants to scream out from the mountaintops just how much it loves being a game with plenty of profanity. I struggle to call Travis Strikes Again: No More Heroes a must-play or even a should play, yet I’m glad I experienced it. 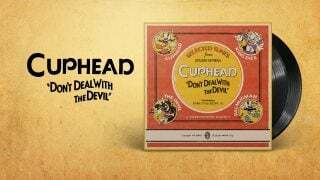 Showing that there’s still potential for good ideas in this series and what can be done with Travis in tow, this spinoff brings its lead back for a different kind of game. Full of trademark style and promising concepts, it doesn’t manage to live up to its own potential, let alone expectations, due to repetitive gameplay and gimmicks that don’t pan out. Hopefully this isn’t the last we see of this world though — there’s still plenty of blood to spill.